This book is another sad and long tall of the American Government breaking treaties of Native Americans. This treaty was signed by George Washington in 1794 and gave the Seneca Nation a parcel of land. The Seneca belong to the Iroquois. This treaty was signed by one of their most fearless and trusted leader and warrior Canandaigua, he was the Chief who signed the treaty and fought for it as well. 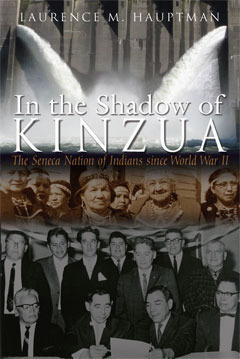 The name Kinzua is the name of the dam and from which the area was being called over the years. The governments’ of New York, Pennsylvania and the federal government. In the 1840s the government took the tribe to court and lost, the court sided with the leaders of the tribe and with the treaty. It was not until the end of WWII that the federal government started going after this land and other Indian land. The reason it was said was that dams were needed to be built for the growth of the nation. The Truman and Eisenhower administrations ended federal regulations and status of approx. 100 tribe’s lands, Rancherias. Displacing 13,263 Native Americans and basically seizing 1,365,801 acres of land that was given to them by our government. The Seneca’s fought immediately in court to delay the taking of their land other tribes were not as fortunate. This same time Truman does away with any Indian commission and comes up with a new title. Indian claims commission migration, if that is not bad enough the person he puts in charge is Dillons Meyer who is a career administrator and headed the war relocation authority from 1942-1946. Yes the same agency that supervised the tragic removal, detention of tens of thousands of Japanese Americans now he was allowed to destroy the Indians as well. The government still had to pass a bill in congress (108) in 53, because it wanted to make sure that they got all of the land they needed in California, Florida, and Texas to be freed for federal control. By 58 the dept. of interior had contrasted 34 power plants and there were dams in the west named, Big Bend, Bonnyville, Boyson, Cochtli, Dulles, Fort Randell ,Garrison ,Glenn Canyon, Gramculee, Roosevelt and Yellow Tail Dam. All were divesting to Native Americans, from there burial grounds to plants they used for medicines’ to name a few. The Arikara, Hidatsa and Mandan on the Missouri river were devastated. Gone was the reservation splitting up families destroying food, timber and coal they used for fuel. The cost of the dam was 299 mill and took them from 47 to 59 to build it. The three tribes did go to court a got 12, 605, and 65. Far less than the Seneca’s would get, but all the tribes still just wanted their land. The fight now went into the Kennedy administration where the tribe lost. During the 50s the government went on a new fight saying that they needed all of these new dams and power plants to keep up with Russia. They just happen to be mostly on Indian land. The fight with the Seneca’s they referred to the Johnstown flood also as an explanation. Since the dam has been built there have been at least two major floods that this dam was supposed to stop when you look at the testimony for approval to do away with the treaty. As during the hearing 15 of the local white population were allowed to testify but no Tribal member until one of the last days when it was reported in a paper that no one from the Tribe had spoken. Then only 5 were allowed to testify. Not only did they build a dam but also a toll road through their land. The nation still has active court cases and with some of the money the new tribal leaders are lawyers, doctors, teachers, business owners etc. also the government had to move the chiefs burial plot to a new resting place, but what was lost cannot be replaced with money. The plants they used for medicine’s some were only found in the area that was flooded plus not everyone’s burial plot was moved. This was a very long book but for me it was worth the time I am glad I read it. THE Iroquois, Seneca are a proud and fighting nation. They are still fighting to this day. I got this book from net galley.